Fill in the solar quote so we can get back to you and assist you. Click on the image for more info on grant scheme. Turning light into clean, affordable electricity. Solar panels silently convert light into electricity. They have no moving parts, require little maintenance and are designed to last for many years. Solar panels use the “photovoltaic effect”, discovered by Edmund Becquerel in 1839, to produce electricity directly from sunlight. The last decade has seen various major advances in photovoltaic technology; these, together with advantageous financing schemes for renewable energy systems, have made photovoltaics a very attractive investment both for home-owners and for industry. How Photovoltaic Solar Panels Work? Solar panels can supply all the electricity needs of a typical household. They are often mounted on the roof or on the ground and connected to the local electric utility, either supplying all the power directly to the home or pumping the excess back to the utility. Apart from reducing your utility electricity bill, homeowners can sell any surplus electricity directly back to the utility. In Malta, investing in solar power is very attractive for 2 main reasons. We get over 300 days of sun and the Malta government scheme reduces the overall cost of purchasing a solar system. Solar panels are also used for commercial applications ranging from large-scale power plants to small family-run businesses. The applications are almost endless, but each has the same idea in mind: harnessing the power of the sun to make clean affordable electricity. Made from silicon or another semiconductor material, they convert solar energy into direct current electricity. 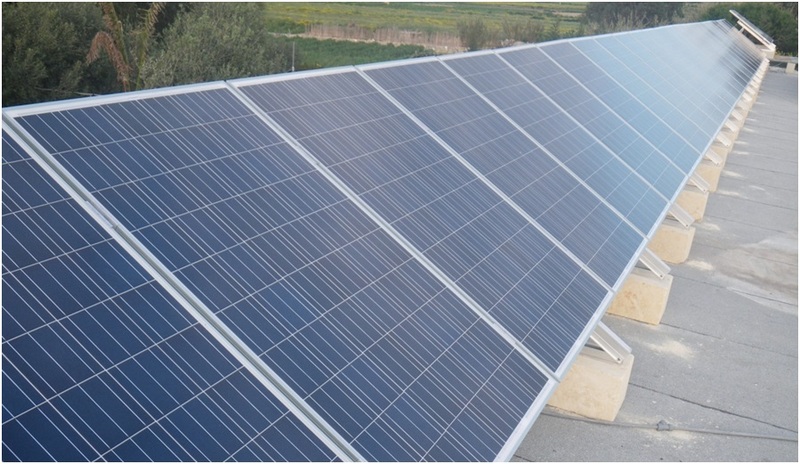 The photovoltaic panels are connected to an inverter that converts the direct current into an alternating current and synchronizes it with the grid. The inverter also offers the possibility of keeping a record of the electricity generated by the photovoltaic system. This is responsible for keeping the PV panels fixed in their location during their whole lifetime. Since most PV systems are installed on the roof, the mounting structure must be certified to withstand the high wind loads it will be subjected to. The panels and inverter are connected together and to the electricity meter by means of electric cables and the necessary switchgear and protective devices. It is important that these cables are adequately sized so that power losses are minimised. It is also essential that the photovoltaic panels are earthed to have a safe installation. Renergy Limited is the leading photovoltaic company in Malta and has partnered with three world leading brands in the production of Photovoltaic cells. You can now take advantage of the government PV grants. If you would like to know more about a photovoltaic system in Malta contact us today for a free quote!